Beelzebub arose on the planet Karatas and while still young became an attendant to His Endlessness Himself on the Most Holy Sun Absolute. He was educated by Saroonoorishan of the planet Deskaldino. In the immaturity and impetuosity of his youth, he became convinced that the running of the Great Universe was conducted illogically. His conviction about this he vigorously propagated to others until the whole Megalocosmos was brought near to the brink of revolution. This stirring up of trouble earned him exile to the system Ors, our solar system. Together with his comrades and their attendants and subordinates, he settled on the planet Mars. While others migrated to the surrounding planets, Beelzebub remained on Mars and there decided to construct an observatory to aid him in the study of surrounding phenomena. During his early years on Mars, while the planet Earth was not yet cooled, the madcap comet Kondoor caused two fragments of the Earth to break off, forming "moon" and "anulios". A Most High Commission, under the Most Great Archangel Sakaki , investigated this catastrophe and concluded that the moon for its proper maintenance, and hence the stability of the whole Solar System, required the production of the sacred askokin on the Earth. This askokin is released by beings on their death and hence it was determined, after permission had been granted from His Endlessness, that the "corresponding" or life should appear on the planet. This in time gave rise to three brained beings called "man". A second Most High Commission later, due to their insecurity of conviction about the stability of the solar system, decided to ensure that men should not become aware of the mechanical reason for their arising in case this drove them to self-extinction. 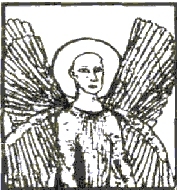 The Archangel Looisos was responsible for devising an organ that was implanted in the base of the spine of men to prevent their perception of reality and forcing them to live by pleasure seeking. A still later third Most High Commission under Sevohtartra decided that the crisis was over and removed the organ Kundabuffer. Beelzebub himself observed with curiosity the arising on Earth of reciprocal destruction and an excessive birth rate and began to take an interest in the psyche of the three brained beings of the planet Earth. Around this time, he made acquaintance with the raven-like beings of the planet Saturn, two of whom were to play an important role in his life. Beelzebub descended personally on Earth first in the time of Atlantis to deal with the crisis brought about by one of his kinsmen who had persuaded the King Appolis to dispense with the use of reward and punishment in running the economy. Beelzebub's solution entailed some of his kinsmen taking on themselves the approbation of the Atlanteans, enabling the king to restore his previous method of government. Soon after leaving Earth, Beelzebub visited the laboratory of the great scientist Gornahoor Harharkh and witnessed the extraordinary properties of the latter's apparatus for 'producing artificial djartklom. It was through the ingenuity of Gornahoor that Beelzebub's teskooano became able to 'magnify' 7,000,285 times and eventually became renowned throughout the universe. Eleven centuries later, Beelzebub was approached by the Archangel Looisos to find a solution to the problem of the wide spread use of animal sacrifice on the Earth, the quantity of which was leading to an overall disturbance in the evolution of the moon. Beelzebub descended to Earth, to Koorkalai, the main city of the Tikliamishian civilization and found a sympathetic being in the form of the priest Abdil whom he convinced of the blasphemous nature of animal sacrifice. Through Abdil, Beelzebub's ideas spread. 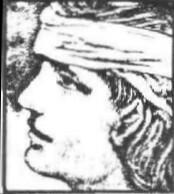 Abdil himself became a victim of persecution and died at the hands of a mob. His remains were taken by Beelzebub to Mars. However, the task was accomplished and animal sacrifice greatly diminished. On his return to Mars, Beelzebub found new arrivals from his home planet, including the female who became his wife. His third descent was to the city Gob in the civilization Maralpleicie. At that time, King Konuzion had invented a religion in which Mister God observed men and rewarded their good deeds with "paradise" and their bad with "hell". 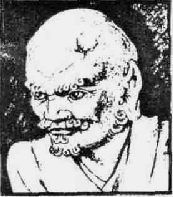 Konuzion's purpose was to diminish his subjects' addiction to opium, but Beelzebub made use of the invented religion to aid in further diminishing animal sacrifice by adding the notion that God had as his observers the very animals which men were liable to sacrifice. Through the mediation of the manager of a chaihana, the idea spread very effectively. 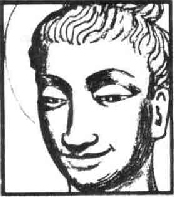 Beelzebub travelled on to Pearl-land of India and discovered the existence of the teachings of Saint Buddha. He came to uncover the original teachings of this Messenger from Above, but decided to make use of them by compounding the distortions that had crept in. In particular, he spread the idea that all creatures, not only men, concentrated the substance Prana. From India he went to Tibet and observed with sorrow the distortions of Buddha's teachings that he found, especially the practice of voluntary suffering in isolation. When he returned to Mars, he found the native inhabitants engaged in constructing canal systems and became interested in their technology. Beelzebub's fourth descent was occasioned by his wish to obtain specimens of the being called "ape" for his friend Gornahoor to clear up the question of the origins of man. He landed near the Red Sea and went to Thebes, the capital of Egypt. While in Egypt, he became interested in the observational 'devices he found there which had been inspired by members of the Akhaldan society who had migrated into Egypt from Ethiopia some time after the destruction of Atlantis. These observatories were then constructed by genuine astrologers. Further observing the conditions of life on the Earth he noticed that the average duration of human life was steadily diminishing. To investigate this phenomenon he made a fifth descent, this time to Babylon. While in Babylon he found the learned beings of the time occupied with the burning question of whether man had a soul or not. At that time, all kinds of confusions concerning human possibilities and morality were rampant. He made the acquaintance of a sympathetic learned being, Hamolinadir, and was present when this being abandoned the superficial reasoning current at the time. Beelzebub also came across the Society for Adherents of Legominism and much enjoyed their Saturday performances of the time theatre. This society had been founded by Pythagoras and Kanil-El-Norkel, who happened to meet in Babylon, and became a society devoted to the transmission of real knowledge to future generations. In his last descent to Earth, Beelzebub spent three hundred years on the planet leaving only in the terrestrial twentieth century. He had become curious about the phenomena of firearms that were introduced into warfare. During this his sixth descent, Beelzebub travelled widely over the Earth. He began in Afghanistan, went to Turkestan, Egypt, Russia, Scandinavia, Germany, France and America. It was during this time that he adapted the role of physician-hypnotist, which enabled him better to study the psyche of men. While in Russia he was presented to the Czar and witnessed the eruption of the Bolshevik revolution. Perhaps his most significant encounter was with the Bokharian Dervish Hadji-Asvatz-Troov. Asvatz-Troov was the only terrestrial being to whom Beelzebub revealed his true nature. This was three years before his final departure from Earth. It was during this period that he made his investigation of the original teaching of Makary Kronbernkzion, putting together a complete copy of the Boolmarshano. One half had passed through the hands of Egyptian priests and eventually fell into the hands of an Aisorian priest, where Beelzebub found it. The other half had to be excavated from somewhere in Central Asia. Soon after returning to Mars, Beelzebub received news of his pardon from the Great Centre and began immediately to prepare for departure from the Solar System. His last investigation concerning the inhabitants of Earth was brought about by the Toof-Nef-Tef, or King of Mars who reported the diminishing life span of his people. With the help of Gornahoor Rakhoorkh, son of Harharkh and his own godson, he was able to establish that it was due to the extraction of electricity on the planet Earth. On returning to his home system of Karatas, Beelzebub took a liking to his grandson Hassein and took both him and his faithful servant Ahoon along on his visit by the spaceship Karnak to the system Pandetznokh, the system of the Pole Star. This journey took place in the year 1921 by terrestrial measurement. During his exile, Beelzebub had made a practice of sending information to his son Tooilan on the planet Purgatory and Beelzebub visited this planet in his journey. Along the way, Beelzebub took the opportunity to educate his grandson who was also fortunate to witness the ceremony in which the horns of Beelzebub were restored. It was then revealed that Beelzebub had attained the gradation of reason of the Sacred Podkoolad, just two stages away from the Reason of His Endlessness Himself. 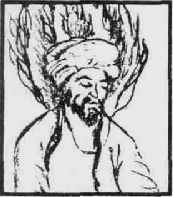 After this ceremony, when pressed by Hassein, Beelzebub expressed his conclusion that only an organ implanted into man, as Kundabuffer was, that would make him aware of the reality of his and others' certain deaths, could rid him of the blindness and egoism that continues to corrupt his possibilities. 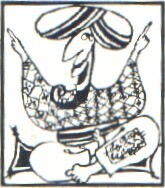 Hassein was the son of Beelzebub's favourite son Tooloof. He was born on the planet Karatas, and at the time of Beelzebub's return to this, his own home planet, after a long exile, Hassein was 4668 years old by conventional Earth calculations - but 12 years old according to the time calculations of his planet of birth. By this time his father had earned the position of Chief Zirlikner, and was thus voluntarily committed to helping all the three-brained beings on that planet to fulfil their being obligations.Such was the disposition of the handsome Hassein, that Beelzebub took an instant liking to him and, seeing that he was at an age where his reason needed to be developed and finding that he had time to spare for this purpose, took it upon himself to educate the boy. For this reason Beelzebub took the lad with him wherever he went from the time of his return from exile. The first of these trips, on the space ship Karnak, was in the year 1921 AD, Earth time, on the occasion of Beelzebub's trip to the planet Revozvradendr for a conference there. Hassein was by nature deeply concerned with the fate of the beings on the planet Earthy and since he had no doubt as to the existence of Objective Justice, was determined to understand just why the souls of the three-brained beings of that planet found themselves in such a terrifying situation. 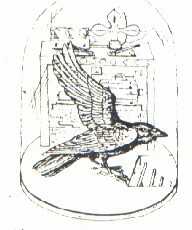 Beelzebub's love for his grandson, "my dear future substitute" as he called him, coupled with his desire to pass on all the information and data he had himself acquired during his investigations into the predicament of the beings on the planet Earth, prompted him to spare no pains in imparting his experience and understanding to him. This last was made possible also by the capacity developed in Hassein, largely due to Beelzebub's method of education, to inwardly digest what was being told to him, and to formulate questions concerning it. Ahoon was, for almost all his life, personal servant to Beelzebub. In common with all of Beelzebub's kinsmen, he went into exile with his master, but had the privilege of accompanying him on all his journeys, including his six descents to Earth. During the journey on the spaceship Karnak from the planet Karatas to the planet Revozvradendr, Ahoon was present at all the discussions and narrations through which Beelzebub instructed his grandson Hassein. In these discussions, he played a largely passive role, never describing his experiences unless asked to specifically by his master. When he did make a speech, he did so in imitation of Beelzebub himself. His embarrassment at speaking in the presence of Beelzebub was usually manifested by arranging the folds of his tail or even wiping his brow with it. 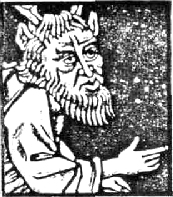 In spite of his closeness to Beelzebub and the great respect and love which he bore towards him, Ahoon was overwhelmed by the manifestation of Beelzebub's Reason after the Sacred Ritual in which he is transfigured and revealed as being of the gradation of the Sacred Podkoolad - that is the last gradation before the Sacred Anklad -the highest being they can attain. He is forced to confess his blindness and explains that this is due to a lack of adequate education during his formative years, which his years of experience could never compensate for. In spite of Beelzebub's boundless compassion and reason, Ahoon could not be helped and his confession only confirmed the importance of the education that Hassein was receiving. Gornahoor Harharkh existed on the planet Saturn and in common with all beings on that planet, he had the bodily form of a raven. He became the essence-friend of Beelzebub who visited Saturn early in his exile to the Solar System. Gornahoor Harharkh was at that time one of the foremost scientists among the ordinary three-brained beings of the whole universe. His life work was concerned with investigations into the Unique-Active-Element, the omni-present-world-substance-okidanokh the particularities of which are the chief cause of everything existing in the universe. For this purpose he invented and built special instruments and apparatuses. Gornahoor Harharkh was able to demonstrate to Beelzebub what can be called 'artificial djartklom' in which the three components of okidanokh are separated and reblended by external control. It was probably just in this artificiality and its consequences that there lay the reasons for his subsequent almost disgrace throughout the universe. Although Gornahoor Harharkh was so highly regarded throughout the universe, and his discoveries and apparatuses were wide spread and used more and more by other planets, his work on the omnipresent okidanokh was later superseded by that of his son, Gornahoor Rhakhoorkh, Beelzebub's godson, and he felt in agreement with the opinion that it was the greatest misfortune for him to have been occupied so long with this. Beelzebub however gained much knowledge and pleasure, as well as apparatuses for his observatory from his essence friendship with Gornahoor Harharkh. 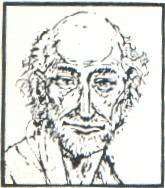 Chief-Common-Universal-Arch-Chemist Physicist Archangel Looisos, while still an Angel and together with other members of a most High Commission of Sacred Individuals, intervened in human existence soon after its arising in order to secure the role desired for mankind in the solar system's overall maintenance. As Arch-Chemist-Physicist, Looisos devised and actualised a special organ called Kundabuffer, which was implanted at the base of the human spine. This extraordinary intervention was required, in the opinion of these sacred individuals, because of a chain of unique circumstances, which began, with the violent collision of the Earth with the comet "Kondoor". This collision according to laws of world maintenance, led the Most High Commission, in it s first descent, to create mankind on Earth with the task, given without their knowledge, of maintaining the two fragments of the Earth, namely Moon and Anoolios, which had been separated in that collision. Under Angel Looisos's direction, Kundabuffer was given the property that, after implantation, mankind would see reality "upside down", and would prefer unreality to reality, thus remaining unaware of this cosmic function. Again, with the help of Looisos the organ Kundabuffer was removed on the third descent of the same Most High Commission, three years by objective time calculation after it had been implanted. ub during the collision with the comet "Kondoor", after the two fragments had been separated from the Earth, the latter had not had time for the "centre-of-gravity" of the whole of it s presence to shift to a corresponding new location. Looisos explained its cause in the shifting of the centre of gravity of the planet to its rightful place. This was done, with satisfaction over his own contribution, to assure Beelzebub that no further cosmic trouble could be caused by the state of this planet. However, he did make the request to Beelzebub that led to Beelzebub's first descent to Earth. There had arisen on the new continents the widespread practice of animal sacrifice that was endangering the formation of an atmosphere on the moon. Looisos requested Beelzebub to bring an end to this practice by appealing to the reason of terrestrial beings, thus avoiding the necessity for some extreme sacred process. Beelzebub succeeded in this labour and subsequently Looisos petitioned our Omni Loving Unibeing Endlessness to reduce Beelzebub's punishment for his earlier personal transgressions. Later, in a second conversation His Conformity revealed to Beelzebub the direct connection between the liberation of the sacred substance Askokin and the formation of higher being bodies in three brained beings in general, by means of conscious labour and intentional suffering. In recognition of these and other labours, Looisos has now been named Chief-Common-Universal-Arch-Chemist-Physicist Archangel. Saint Krishnatkharna was a Messenger sent specially to Gemchania or India. He was founder of the Group of Seven initiated beings who were guardians of his instructions. The group continued through and beyond the time of Saint Buddha and later Saint Lama, both of whom discovered the instructions of Saint Krishnatkharna and renewed them by incorporating them into their own teachings as its foundations, thereby earning the allegiance of the Group of Seven who became their followers. Siddhartha Gautama was born in 563 BC in the Lumbini gardens which lie just over the modern border of Nepal Terai. His mother, Maya, was journeying to her home at Kapilavastu, which was the capital of her own Sakya clan whose country lay along the southern edge of Nepal. 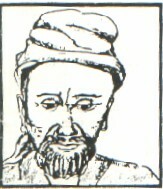 His father was Raja of this clan and his name was Suddhodana. Siddhartha was Prabhapala Boddhisatva Mahasatwa and at his birth he was found to possess the thirty-two physical marks that indicate a Chakravasti, great emperor or a perfect Tathagata or Buddha. Further indications were the seven steps to the north, east, south and west that the baby took. At each step lotus flowers sprang up beneath his feet. He lived a normal, though restless, childhood and was married at about the age of sixteen to Yasodhara and they had a son Rahula. His father now remembered the prediction at his birth; that if he remained a prince he would become a Chakravasti or if he entered the religious path he would become a Buddha. Determined to keep him away from the second alternative, his father built for him a pleasure palace and surrounded him with all sorts of sensuous delights so that his son would get no idea of the suffering in the world and so not be drawn to the religious path. But the young man went driving from the palace and saw first an old man, then a sick man and finally a dead man. The sight of all this suffering activated a call he had been hearing for years. Ho rode off that night on his stallion Kanthaka and when he reached the forest be cut off his long black hair and sent it back to the palace with his horseman. His age was now twenty-nine. He visited sages but none possessed what he was looking for and so he entered six years of meditation and asceticism. Although he succeeded in mastering his mind and passions he still had not reached Enlightenment. He realised that this could not be found in such an emaciated physical condition as his so he accepted a bowl of curds and sat down at the foot of a pipal tree to await Enlightenment, however long that might take. Mara, the Tempter, tried to lure him away but the Boddhisatva called upon Earth as a witness to his rightful state and Mara withdrew. Now Siddhartha was able to bind in one the Self that is entirely human with the Self that is pure Enlightenment. A new Buddha was upon Earth and the Earth rejoiced. For forty-five years the Buddha travelled from place to place in Northeast India proclaiming his Dhamma. He was an intensely human person with a fine sense of humour and very great compassion and it was his apparent preoccupation with suffering that was so appealing to the Indian people. Undoubtedly there is something about the mentality of these people that cannot get away from suffering. Nowhere else in the world is there such a tendency towards the indulging in suffering and the followers of Buddha have always managed to superimpose this on the teaching. Before his death the Buddha announced to his followers his intention of leaving them. The Master was invited to dine at the house of a blacksmith who prepared a meal of pig's meat. A little while after tins meal, the Buddha lay down on his right side and gave his final address: "Decay is inherent in all things, work out your salvation with diligence". This "Full-of-Faith Sacred Individual" was born in Tibet, sent down onto the Earth as a genuine messenger from Our Endlessness. His life and teaching provided the inspiration for the Lamaist religion, which together with the Buddhist, Hebrew, Christian and Mohammedan made up the five major religions which still exist to this day. Saint Lama was the last Sacred Individual to be sent down into Tibet. His teaching formed part of the chain of transmission begun by Saint Krishnatkharna in Gemchania or India, and was continued and developed by Saint Buddha. The chief responsibility for transmitting his chain of teaching from generation to generation was carried by a group of seven individuals originally initiated by Saint Krishnatkharna himself. Saint Buddha and later Saint Lama, while preserving the essence of his teaching, adapted and developed it to suit the existing environment and psyche of the people living in their times. The teaching of Saint Lama was not as widely disseminated as those of the other four religions due to the isolation and general inaccessibility of Tibet. The fact that the people of Tibet were so isolated had the distinct advantage that they were relatively free from the many adverse influences in the countries around them. The followers of Saint Lama were therefore more receptive to his work, and although they distorted part of his teaching, enough remained and grew in them to make it possible for them to work constructively towards their own liberation. The people of Tibet were thereafter able to live their lives and organise their community according to their understanding of the teaching of Saint Lama and according to the strength of their spiritual aspiration. Their work continued along fruitful lines for many generations, the essence of the Lamaist teaching being transmitted by the group of seven. The destruction of the work of Saint Lama and the end of the chain of transmission through Saint Krishnatkharna and Saint Buddha came suddenly and unexpectedly with the death of the leader of the group of seven. This occurred with the Younghusband Expedition of 1902 during the Anglo-Tibetan war. Not only was this chain of transmission broken but also many books and records of the teachings of these three saints were destroyed. During the year 1902 in response to the unexpected Younghusband Expedition into Tibet a gathering of all the Tibetan Chiefs was called. This assembly included amongst its number the leader of the group of seven. Their initial decision, which was to politely ask the foreigners to leave, was a complete failure and on further discussion they proposed to destroy the expedition by force. The leader of this small spiritual group persuaded them against this because in the eyes of our "Common Creator God" all life was equally precious and the death of so many would only further increase the ' great burden that He carried as a result of our abnormal existence on Earth. The assembly of Tibetan Chiefs were deeply moved by the words of this future Saint and decided to send out certain of their gathering to persuade the local people not to hinder the expedition by any forceful means. The leader of the seven was one of those chosen for this task and while attempting to fulfil it was shot by one of the foreigners. The most serious consequence of his death lay in the fact that Saint Lama had laid down quite explicitly the way in which transmission of his teaching should be carried out. Certain absolutely vital and secret instructions were to be transmitted exclusively by the leader of the group and the remaining members could only by initiated when they had reached the necessary level of spiritual attainment. The six who had brought their self perfecting up to the final degree were in fact almost ready for this final initiation and the death of their leader seemed to have destroyed this possibility. In despair they recovered the body of their chief and resolved to attempt to communicate with his "Reason" by means of the "Sacred Almznoshinoo". Part of this process consists of the energising of the Kesdjan or second being body of the deceased by the intentional injection of the energy Hanbledzoin, the blood of this higher being body, a process known as Vallikrin, thus enabling the Kesdjan body to take on, at least for a time some of the functions fulfilled previously by the physical body. The Sacred Almznoshinoo is dependent on certain definite requirements. Firstly that both the deceased and those performing the ceremony have attained the necessary degree of spiritual development and secondly that the higher being bodies are still contactable. This second requirement necessitated creating a link with the Kesdjan body of the deceased before his death, through the blending of a particle of his Hanbledzoin with theirs. Although the six great initiates were fully aware that the latter requirement had not been fulfilled they still proceeded to attempt this sacred ceremony in order that these last instructions of Saint Lama might not be lost. As the necessary link with their dead chief's Kesdjan body had not been established their Hanbledzoin only gathered chaotically over his physical body and resulted in a devastating explosion. This "Sobrionolian contact" or explosion killed the remaining six, destroyed the books and relics of their tradition and effectively brought to an end the line of transmission begun by Saint Krishnatkharna. As a direct result of these events life on the planet Earth deteriorated still further after 1903. Saint Jesus, a Sacred Individual sent from Above was actualised in a planetary body at the small town of Nazareth among those peoples of Egypt that Saint Moses had led to the land called Canaan. As soon as He had formed Himself for a corresponding existence He commenced the mission imposed on Him from Above: to enlighten the reason of the three-brained beings of the planet Earth that they might free themselves from the tyrant consequences of the properties of the organ Kundabuffer. To this end He personally chose twelve beings of different types to be initiated by Him and specially prepared. These beings were called the Disciples. 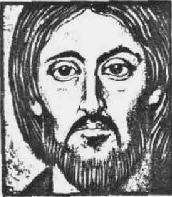 Unfortunately before Saint Christ had completed this transmission with the required instructions for the future, external forces independent of Him were such that it became inevitable that He permit the premature destruction of His planetary Body. Realising this He decided they should perform on His Body Kesdjan the Sacred Sacrament Almznoshinoo in order that they might continue to communicate with His Divine Reason whilst He remained in such a Cosmic Individual State. When it became apparent that there was not even time to complete this Sacred Sacrament and all would have been lost, one of the Disciples, named Judas, took it upon himself to delay the arrival of the mob and saved the situation. The Teachings of this genuine Messenger of His Endlessness based on Resplendent Love - the All Lovingness and All Forgivingness of Our Common Father - quickly spread to one third of all the beings of the planet but, as is always the case here, were from the very beginning even, distorted. Gathered together into one whole from bits here and bits there, the followers of the teachings of Saint Christ quickly divided into sects: "Orthodox", "Sevrodox", "Ypsylodox" "Hamilidox" etc. Into the teachings, for egoistic and political ends, were added fragments from' other religions, even fragments quite definitely opposed to the genuine Teaching of Saint Christ. During the middle ages the "Elders of the Church" inserted the Babylonian dualistic doctrine with the result it no longer bears any relationship to the original teaching of that Sacred Individual. The small sect, the Brotherhood of the Essenes are the one exception and have kept alive the almost pure teaching, handing it down from generation to generation. The "Holy Writ" of the followers of this religion, parts of which were originally intended as an allegory of the mysteries revealed by Saint Christ are there now only taken literally. The result: when for example, the beings, with their almost non-existent reason, realise that once a planetary body has been destroyed it can never be reformed, then they begin to doubt even these genuine teachings of Saint Jesus that have survived. And Judas is now taught to be the vilest of traitors. He was also the first on the planet Earth, who for the mission assigned to Him, refused to employ the ordinary methods which had been established during centuries by all other Messengers from Above. He taught nothing whatever here, nor did he preach, and in consequence none of His teachings passed in any form even to the third generation after His departure. Instead, information relating to His Very Saintly Activities passed from generation to generation through 'initiates' by means of a Legominism of His deliberations entitled "The Terror of the Situation." In this Legominism Ashiata Shiemash discusses his detailed deliberations concerning whether the three foreordained sacred ways for self-perfecting based on the being impulses 'Faith', 'Hope' and 'Love' could be used for the task assigned to Him. After long preparations, deliberations and meditations He concluded that it was too late to save contemporary mankind by any of the three sacred ways because the corresponding functions had become completely mixed with the properties of the organ Kundabuffer. After a year of further observations he concluded that the being-impulse Objective Conscience was not yet atrophied, but remained almost in its primordial state, because it had in fact gradually penetrated and become embedded in the human 'subconscious', where it took no part in the function of waking existence. He further concluded that it would be possible to save the contemporary three-brained beings only if the being impulse conscience were to participate without fail in the functioning of the consciousness in which they spent their daily existence, and, moreover, participate in this way over a long period of time. Through His subsequent Very Saintly Activities, Ashiata Shiemash established an organization, the Brotherhood Heechtvori, the name of which signifies "Only-he-will-be-called-and-will-become-the-Son-of-God-who-acquires-in-himself-Conscience". 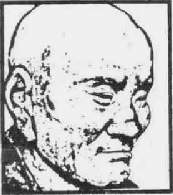 Through the initiates of this brotherhood He was able to establish conditions which led to nearly all of his contemporaries on the continent Asia wishing and striving with all their spiritualised being parts to have in their ordinary waking consciousness the Divine genuine objective conscience. In consequence they began to work upon themselves under the guidance of the initiates and priests of the brotherhood Heechtvori. As a result of all this there disappeared within 10 years both various forms of 'state organisations' and also the divisions of mankind into 'castes' and 'classes'. Many other positive consequences ensued, including the formulation of five 'being-obligolnian strivings', and the ceasing of war on that continent during the entire Ashiatian Epoch. However, shortly after the departure from the planet of the Very Saintly Ashiata Shiemash the people of Asia themselves destroyed all the results of His conscious labours. This was instigated by the construction and presentation of the 'Kashireitleer' of the future Universal Hasnamus Lentrohamsanin and furthered by the labours of the learned beings assembled in the city of Babylon. The last traces were removed by Greek and Roman learned beings. King Konuzion appeared a few generations after the disappearance of the continent Atlantis, from the second catastrophe that befell the planet Earth. In Atlantis there had been a uniquely great and learned society called Akhaldan and shortly before the second catastrophe a representative of this society travelled to the land called Ashhark or Asia and met with some fellow countrymen who had been on a hunting expedition and had decided to make their home there. They chose this representative of the society Akhaldan as their leader and he married the daughter of one of them. By the time the grandson of the grandson of this marriage had been born these people had founded the city of Gob in the part of Asia called Maralpleicie. This hereditary leader of theirs was called King Konuzion. By this time also the general effectiveness and well being of the people had gone into a sharp decline and King Konuzion set himself to establish the cause. The cause he found to be none other than the chewing of opium. Without further thought he imposed a ban on the taking of opium. But to his great consternation he soon found that these measures were having the opposite effect. He thereupon plunged himself into thought for 18 days and came up with the following plan.... "I will invent for my people the idea of Paradise to which delectable place the souls of the dead will go provided they have conducted themselves in a proper manner during life. On the other hand souls that have not lived to God's commandments will go to a terrible place called Hell". The idea worked well, but there was one drawback. This new "religion" of King Konuzion, founded as it was on a fraudulent base had the long term result that all "Morality" was from then on based on this "religion" and not directly on Conscience. It should be noted that Beelzebub himself made use of this same "religion" in his aim of suppressing the custom of Sacrificial Offerings. Belcultassi lived on the continent Atlantis, a region of the earth where civilisation was concentrated several thousand years ago, before the known civilisations of Egypt, Sumeria and China. 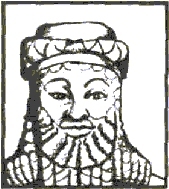 Belcultassi provided the inspiration and leadership that led to the foundation of the "Society of Akhaldan" 735 years before the second Transapalnian Perturbation which destroyed the continent Atlantis. He became the originator of this Society, able to discover true objective knowledge of various kinds, through his direct perception of the phenomena taking place in him. 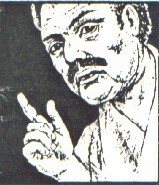 Following the foundation of the Society Akhaldan Belcultassi was then able to bring the "perfecting of his higher being part to the Being of a Saint Eternal Individual". His awakening was sudden and came with the tremendous shock of the realisation that until then his life had not been lived in accord' with the "sense and aim of his existence". From this moment and with total commitment he dedicated himself to the understanding and solution of this problem. His starting point was to acquire enough strength and powers, through tremendous effort, to be entirely honest and sincere with himself. Having achieved 'this he then proceeded to analyse, through his power of contemplation, all his past internal psychic activity and his external behaviour or manifestation to see when he had been able to act consciously and when he had acted mechanically. He also looked carefully at how he had received those impressions and influences coming from outside of himself and when and how he had experienced with the whole of his being. Convinced that he was not really as he ought to be, that his life was not really in accord with the sense and aim of his existence and not satisfied with the condition of his own psyche he decided to verify the observations that he had made. In order to do this he decided to work with others and attempt to discover whether or not they too would come to the same conclusions. With considerable care Belcultassi awakened them to sincere self-observation and they then began to see in themselves all the characteristics that he had observed in himself. This group, under the guidance of Belcultassi, then began to meet with one another to discuss their observations and later they founded the Society of Akhaldan. The use of the word Akhaldan expressed the following: "the striving to become Aware of the Being of beings". The members of this Society known as "Akhaldan Sovors " dedicated themselves to the understanding of what it was in their nature that prevented them from existing as Real Men and how it would be possible to eradicate this. In order to acquire both the depth and breadth of knowledge necessary for their task they divided themselves into seven groups for more specialised study. Out of their work there arose for the first time on the planet Earth "genuine objective science" which continued to develop for many years, to the benefit of all men, until they began to realise that a serious catastrophe was about to take place on the Earth. The members of the Society Akhaldan dispersed over the planet to investigate these signs more carefully. While scattered in this way the second Transapalnian Perturbation, which destroyed the continent Atlantis occurred. The survivors of this Society managed to regroup on the continent Grabontzi or Africa, and eventually on the advice of a member of Beelzebub's tribe migrated to Egypt around the source of the river Nipilhooatchi or Nile. They were however never able to fulfil their original task. Makary Kronbernkzion arose and existed on the continent Atlantis. His parents and the conditions of his upbringing were very favourable and he received almost the same data for the Being of a future responsible being as every Keschapmartnian three-brained being should possess at his arising on' any planet of the Great Megalocosmos. He was trained as a scientist and became a good one by earthly standards. He became a full member of the learned Society Akhaldan. He saw clearly, in the course of his scientific work the real value of his own significance and sincerely realised his "nullity". Being sorely grieved with these realizations and with constant meditation, hope began to arise in his entire presence, that Conscious Labours and Intentional Sufferings might transform him from nothing to 'something'. So he began to work on himself and on his denying part on those lines. He came to understand certain cosmic truths, which he published under the title "The Affirming and Denying Influences on Man". Beelzebub took much trouble to discover and put together scattered fragments of this "Boolmarshano", which on the continent of Atlantis took the place of books now used by contemporary beings. In this case the original was carved 'by Makary Kronbernkzion himself on marble and placed in a cathedral. Copies were made on ivory for other centres, but all were lost and broken in the cataclysm that occurred to Atlantis. One only survived in Africa, but in two separated halves. In it Makary Kronbernkzion described the three independent world forces by which Reciprocal Maintenance of all existence proceeds. Namely: the first force arises from causes proceeding in the Prime Source itself and flows out therefrom. The Second World Force is what the first force becomes, when having spent the momentum it has received, it strives to re-blend with the Source according to the Law "The effects of a cause must always re-enter the cause". Both forces are independent, with their own properties. The first constantly involves and the second evolves. Since the first arises in the cause of everything existing and receives in itself the possibility of manifesting vivifyingness, it can be considered "Good", that is as a factor for the actualising of the backward-flowing effects, which in relation to this first force can and must be considered as "Evil". The first force, which is compelled by causes in the Prime Source, can be considered passive. And the second backward-flowing force, because it must resist in order to penetrate back and withstand the outward flowing first force, must be regarded as active. The third independent world force is the result of the clash of the first two, descending and ascending forces. It is nevertheless the spiritualising and reconciling source of every world formation, because it must remain in them as a presence while the results of the various resistances between the first two forces exist. In later times Makary Kronbernkzion's notion of Good and Evil became adopted in a distorted fashion as the basis of all terrestrial religions. In its distorted form it became so maleficient that it severely retarded the perfecting of the higher-being part of terrestrial individuals. Through the lengthy etherograms sent by Beelzebub to his son Tooilan on the planet Purgatory, the All-Quarters-Maintainer, the Arch-Cherub Helkgematios learnt of the great retardation on Earth, which led to fifty Righteous Souls making an investigation which found that Makary Kronbernkzion was responsible for the disastrous state of affairs. They recommended sending a special Messenger from Above to uproot the idea of Good and Evil and also requested our Common Father not to allow the terrestrial three-brained author who caused the arising of the idea onto the Holy Planet, even if he had attained the required gradation of Sacred Reason, but to doom him eternally to the planet Remorse of Conscience. However Makary Kronbernkzion was already considered one of the first candidates to be taken on to the Most Holy Sun Absolute. This caused much debate, and remorse, amongst the whole of the Holy Planet. Eventually a resolution was made to request the mitigation of the sentence on the higher part of Makary Kronbernkzion, which was granted by our All Most Gracious Greater Endlessness, and he was allowed to remain on the holy planet until the results of his evil deed were revealed. Our Common Father evidently hoped that the three-brained beings on Earth might ultimately themselves recognise their errors and begin to exist as is becoming for three-centred beings. The future of Makary Kronbernkzion now depends exclusively on the three-brained beings on Earth. Beelzebub could not personally confirm that the idea of 'Good and Evil" was the fundamental cause of all the abnormalities of the psyche of his Grandson's favourites. Makary Kronbernkzion did first use the words 'Good' and 'Evil' but they acquired a maleficient sense in the existence of the beings of later generations for which he was not to blame, data being crystallised in their general psyches - spontaneously and also through their strange consciousness - engendering the conviction that the causes of their good and bad manifestations "are not they themselves personally nor their own criminal essence-egoism" but some or other objective source of 'Good' or 'Evil' outside of them and not depending on them at all. The twins Choon-Kil-Tez, Choon-Tro-Pel (Choon = Prince) were born in the city of Gob in the Kingdom of Maralpleicie, great grandsons of King Konuzion a descendant of a learned member of the Society Akhaldan who was chosen by the people of Maralpleicie, after the destruction of Atlantis, to be their first king. Their childhood was spent in Gob but with the coming of the sands which devastated their homeland they, with many of their people, were forced to flee to the East and settled for the first time in what is now known as China. In their upbringing they were fortunate to have been given the correct conditions for self development and were blessed with a determination to attain to a "higher state of being" and to be of service to their fellows. Their initial choice of profession was medicine, perhaps partly because the people of Maralpleicie had an inherent weakness - the chewing of poppy seeds, known as the "dream maker". This habit had reached such appalling proportions in the time of King Konuzion that he had been forced to invent the first "religious teaching" or morality to combat the problem. On settling in China and resuming their normal occupations the brothers rediscovered the Law of Heptaparaparshinokh, knowledge of which had been lost with the destruction of Atlantis. In this, the maleficient poppy was instrumental. They found that they could obtain seven different substances from opium, each with different properties and from each of which a further seven could be obtained and so on almost to infinity. This so amazed them that they dropped everything else to investigate these phenomena bringing into their researches light and sound, which they again found to consist of "seven independent phenomena in their internal structure and functioning". 3. That the higher vibrations of one "result" will always give direction to the lower vibrations of other "results". They were by then Men of Knowledge, later became Saints and now reside on the Holy Planet Purgatory. 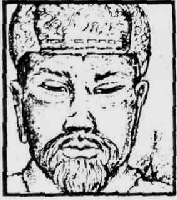 King Too-Toz was a Chinese learned being and a follower of the twin brothers Choon-Kil-Tez and Choon-Tro-Pel. One hundred and fifty years after their death he developed an apparatus called Lav-Merv-Nokh from the middle part of the brother's apparatus Alla-attapan. This apparatus became widely known among almost all of the learned beings of our Great Megalocosmos. 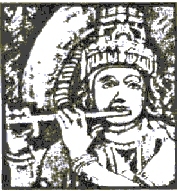 The apparatus spanned seven octaves of whole notes, the total consonance of which coincided with what the brothers called the "Nirioonossian World Sound", the sound discovered by their father, a member of the Society of Akhaldan, and which could be heard in the locality of the City of Gob. Each of the octaves was constructed of seven white and five black strings. In addition, the white whole notes were separated by hair strings producing what were called chaotic vibrations dependent on surrounding conditions. Fourteen strings made of twisted intestines were also placed between each of the other strings and painted red. The whole arrangement of strings corresponded to the concise arrangement of "sources" between any planet and the Sun Absolute. 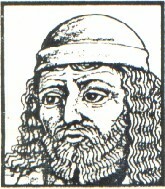 Hamolinadir was born in Babylon of Assyrian parents but educated - in Egypt at the then highest school on Earth, named the 'School-for-the-materializing-of-thought' only to be brought back to Babylon, under compulsion, by the Persian King Cambyses, at the time of his craze for the science of Alchemy. His upbringing was such that he was normally self-conscious, impartial, sincere, perceptive, alert and sympathetic. He is remembered now for his invention of the phrase "Building-of-the-tower-of-Babel". Hamolinadir met Beelzebub on his visit to Babylon and took him to the meetings of the learned beings on the then "burning-question-of- the-day"; namely whether man had a soul. Seven months later, when there was held a "general-learned-Conference" on this subject, amongst all the learned beings of Babylon, both those brought by force and those who came later of their own volition to this centre of learning, both he and Beelzebub attended. Hamolinadir spoke of it but his report was entitled the "Instability of Human Reason", He commenced with a masterly analysis of the head brain but then, becoming more and more agitated, he started to shout, all the time mercilessly criticising his own reason, At this point he broke down but continuing to shout, proved how easy it was to convince the human reason of anything, After calming himself a little with a glass of water he continued with the "Burning-question-of-the-day", showing that the arguments of both those who proved there was a soul and those who proved the contrary to be equally logical and convincing, and that he was an "idiot-cubed". He finished his address by saying that there, now in Babylon, everyone was building a tower by which they could ascend to Heaven to see what was going on. But that as the bricks of this tower were all of different material, some iron, some even eider down, the tower would fall and, as he personally had no desire to be crushed by the tower of Babel, he would leave immediately. There and then he left for Nineveh where he lived happily to a ripe old age growing maize. Atarnakh was born in the Asian city of Mosulopolis of Kurdish parents not long after the time of Mohammed. He became a very learned man without in the process losing his very great self-love and pride. He spent many years studying the question, "What in general is the sense of man's existence?" and became a member of "The-Earth-Is-Equally-Free-For-All" society. This society was formed from wise and impartial men from many countries and had as its aim the establishment of one common religion, one common language and one basic government for the people of Asia. 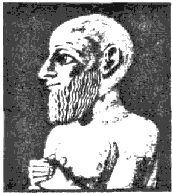 When, by chance, there fell into Atarnakh's hands an ancient Sumerian manuscript in which was written "In all probability there exists in the world some law of reciprocal maintenance of everything existing" this became the basis of his research and culminated in the publication of his chief work "Why Do Wars Occur On Earth". His theory was that the law of reciprocal maintenance required, amongst other things, certain substances created by the process of life, which were only released to the cosmic exchange by death. It therefore followed there were certain times when a large number of deaths were required to produce the necessary power and hence war. When Atarnakh read the paper to the learned society they were thrown into confusion and quickly divided into two camps; those who held his theory to be correct a~ those who stubbornly maintained that if their programmes were implemented then there would ~ no wars. The battle raged for three days. With Atarnakh's party the victors it was decided to wind up the society and disperse. However at that very moment Atarnakh rose saying that there was no need for them to disband since, as the cosmic process only required death, then they should campaign for the introduction of the ancient custom of animal sacrifice. After much further consternation the inevitable result was reached and the Society "The-Earth-Is-Equally-Free-For-All" became the Society "The-Earth-Only-For-Man". In this form they were so successful that within one hundred years the slaughter was immense: in one year, at one place alone, l00, 000 animals were killed. Within the next two centuries the custom spread not only through all the Mohammedan countries but also even to Christian feasts. In truth wars did diminish but then so did the general life span. The birth rate increased and so it would have continued but for the intervention of a Persian Dervish named Assadulla Ibrahim Ogly, who, seeing in animal sacrifice only a horrible injustice, dedicated his life to the destruction of the habit. He succeeded with the result of the first great World War of 1914-18. Atarnakh's failure was in seeing the Law of Reciprocal Maintenance as quantitative and not qualitative and in not realising that when the required quality of substance was produced it was released during life and not only on death. Hadji-Asvatz-Troov was born into a very wealthy merchant family in Bokhara. As a young man he had everything money can bring, including the most sumptuous harem on earth. His hobby was to make stringed musical instruments. But eventually this indulgent life bored him to the point of suicide and only the thought of the suffering this would cause to his mother prevented him from taking his own life. On her death he took to the religious life, after an encounter with a wandering Dervish. As a Murid he was given the task by his Sheikh of recovering the lost art whereby sacred music could evoke in the participants the appropriate sensations corresponding to the texts. To this end, together with a Dervish friend called Kerbalai-Azis-Nuaran, a watch maker by profession, they invented a mechanical piano to be tuned in one-eighth toned sounds according to the ancient Chinese absolute note "Do". However, on tuning this instrument in this manner, according to the principle that the number of vibrations of a string are inversely proportional to its length, they were astonished to find that there were strings which on occasion produced discordant sounds. This discovery gave rise to his life long passion, the Science of Vibrations. With their Sheikh's Blessing they retired to a remote mountainous part of "upper Bokhara" where, in a series of mysterious "underground caves" they set up their experiments and lived. 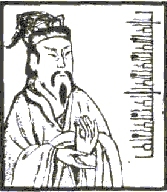 There Hadji became a great authority on the ancient Chinese science of the brothers Kil-Tez and Tro-Pel, fragments of whose wisdom had reached his time, but they included in their research all the then known theories on vibrations, including those of the Assyrian Malmanash, the Arab Selneh-eh-Avaz and the Greek Pythagoras. With his compassionate nature the aim was always to discover the Law of Vibrations and thus those beneficial and those harmful to Earth beings, and so they expanded their field of research to colour, architecture, music, art etc. They succeeded. It is worth noting that they conclusively demonstrated that the most harmful vibrations from any contemporary substance were those of the medical remedies. After many years of harmonious and fruitful existence with his friend, Azis-Nuaran was killed by a stray bullet whilst fetching materials for their experiments. Hadji, by now elderly and a very tall, thin, wispy haired individual, was visited by the great Beelzebub during his last sojourn on the planet Earth. He earned the unique distinction of becoming the only being of the planet Earth ever to recognise and come to know Beelzebub's true nature, He accomplished this when a demonstration according to the Exact Science realised by him failed, in the case of Beelzebub, to produce the inevitable result. In his latter days he involved himself in the question, "Why did God make louse and tiger?" Inscription of the Temple of Delphi. The Pythagorean tradition had its origins in this Temple of Apollo at Delphi. Apollo is one of the two sons of Jupiter. The other is Dionysus, who represents the esoteric truth, the darkness, the divine universal spirit and out of the darkness comes the manifestation of this spirit to man, light, Apollo is equated with this light, the Sun, the logos. In spring Apollo arrives at the temple of Delphi where he slays the serpent, Python. The slaying of Python is symbolic of the initiate who pierces nature by the science of divination, by purification. In autumn Apollo returns to his homeland, the land of the Hyperboreans, a land of luminous souls. The parents of Pythagoras were advised by the female initiate, called the 'Pythoness' who possessed this direct spiritual vision, that their son would be unsurpassed in wisdom and of the greatest advantage to the human race. 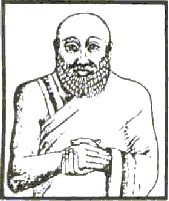 Pythagoras lived in Samos in about 580BC, probably just before Gautama the Buddha and Lao Tse. He was instructed by a number of philosophers in Greece, particularly Thales, and then travelled to Sidon where he was instructed in the mysteries of the Phoenicians. He was in Egypt for twenty two years learning the occult sciences possessed by the priests of Memphis. While he was there, this centre of science was destroyed, in 525 BC, by the armies of Cambyses, the son of the conqueror of Babylon. 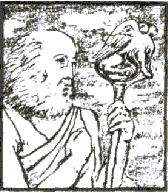 Pythagoras and some of the Egyptian priests were taken to Babylon where conditions for the preservation of occult knowledge were deteriorating under the regime. However Pythagoras was able to secure the knowledge not only of the Chaldean priests but also the survivors of the Persian Magi and the elite of the Jewish captivity. It was here that he met the Moor Kanil-El-Norkel and they decided to form the "Club of the Adherents of Legominism" because they were living in troubled times and many initiates who possessed the secret knowledge were being killed. The task was to find some way of preserving this knowledge and transmitting it to future generations in some way other than through initiates. The one hundred and thirty nine members of this club considered that the best way to do this would be to fix it as art forms such as painting, architecture, sculpture, theatre and music. The method of holding the information in these artefacts was to make certain adjustments to the natural laws of harmony that form the basis of art. After twelve years, Pythagoras was able to leave Babylon and first went to Delphi where the art of divination had declined. He imparted to the priests there all the secrets of his accumulated knowledge and prepared Theoclea for her ministry. She became an inspired Pythoness and once again Delphi became a centre for life and action. Pythagoras left for Croton in Southern Italy where he brought his 'institute' into being. This was the culmination of his efforts to gather and preserve the ancient knowledge. 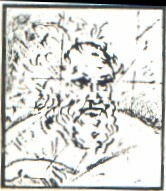 Leonardo da Vinci was born in 1452, the illegitimate son of Ser Piero da Vinci and Caterina, at the small town of Vinci in Tuscany. As a man he had great physical strength, an immense quick intellect ~ the power to bring peace to all who knew him. Hospitable always to the deserving, a great lover of animals, the virtues he stressed forgiveness and the manly acceptance of toil. Though best known as an artist, painter and sculptor the list of list accomplishments is almost endless: scientist, astronomer, physicist, architect, military, mechanical, hydraulics engineer, mathematician, inventor, geologist, physiologist etc. Forever seeking to understand the universal laws, to see the whole, but always beginning from the position of experience, he produced, amongst others, theorems on the composition and resolution of forces, on the principles of flight and a canon of proportions for the human body. He was dedicated to the realisation of truth. Science to him was "Knowledge of things possible in the future, of the present and in the past", and from the past he gained many valuable insights. 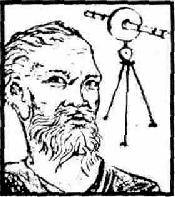 For example in mathematics he rediscovered theorems known to the Arab Alhazen and his invention of the telescope owed much to Alhazen's work on the "glass hemisphere" or lens. His most favoured occupation was painting, to him the supreme end of knowledge, the fusion of the science of human and natural process with art. Painting which "apprehends the essential Truth" was to him the "sole initiator of everything in nature, grandchild of nature and related to God". Always seeking truth he wrote "O thou that sleepest - what is sleep? Sleep resembles death. Why then doest thou not work in such a wise that after death thou mayest attain a resemblance to perfect life, rather than during life make thyself like the hapless dead by sleeping?" Mullah Nassr Eddin or, as he was also known, Hadj Nassr Eddin, was born and lived on the continent of Asia. 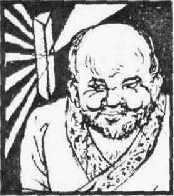 This legendary is figure is not well known in America but throughout Asia is renowned for his tales and numerrous sayings. 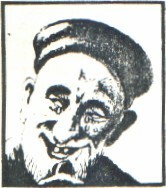 He was an earthy and character, benevolent and but with a sharp wit and a ability to express in the biting terms the absurdity of much of the life around He was highly respected by Beelzebub himself, who was grateful to him for the advice and teaching that he received, both in personal meetings and through his sayings. Beelzebub in fact had numerous meetings with Mullah Nassr Eddin in Persia during the latter part of sixth and last visit to Earth when he was investigating the life and work of the Most Saintly Ashiata Shiemash and the peculiar human custom of politeness. During meetings they would sit together and discuss all manner philosophical questions concerning the life, customs psyche of the people of Earth. Beelzebub particularly gratefu1 to the Mullah for helping him understand many peculiar aspects of the life and psyche man which enabled him to lead a reasonab1y tolerable existence in the many countries that he visited. It was said that for any situations. Significant or otherwise, the wise Mullah Nassr Eddin would have a suitable saying. In these sayings he would often express himself allegorically and in a manner that was not always readily comphrehensible. They would also be delivered with the humour, contempt and "subtle venom" that was so much a part of his nature. They also often contained sound practical advice such as "without greasing the palm, not only is it impossible to live anywhere tolerably, but even to breathe", or took the form of a biting attack on the subject or group of people, "for our sins God has sent us two kinds of physicians, one kind to help us die and the other to prevent us living". Most significantly of all however, these sayings are remarkable for the intelligence of the Mullah's observations and the evident truths contained in them. "Ekh, Brother! here on Earth if you speak the truth you're a great fool, whereas if you wriggle with your soul you are only a scoundrel, though also a big one; so it is best of all to do nothing, but just recline on your divan and learn to sing like the sparrow that had not yet turned into an American canary". The story of the Transcaucasian Kurd and his misfortunes became known to Gurdjieff in his youth. The Kurd was an ignorant man of the hills who knew little of the ways of the valleys and cities, Indeed, living as he did, he hardly knew anything of the variety of foodstuffs a townsdweller could enjoy. It was because of this he was fooled by the attractive appearance of a 'fruit' he saw in a shop on one of his occasional visits to a town and he decided to spend his last two cents in buying a pound of it. The Transcaucasian Kurd's behaviour on discovering the burning horror of the red peppers he had bought has become a symbol for a certain inherency in the general psyche of people. Instead of the seemingly rational approach of putting an end to his suffering; because his last money is sunk into them, the Kurd went on eating to the bitter end. Lentrohamsanin was born to elderly and very rich parents at Kronbookhon, the capital of Nievia, Asia. His parents had avoided children until late in their lives, by means of abortion, being too engrossed in amassing a fortune. His father was a merchant; his mother, initially an abortionist, later purchased a mountain on which she established a "Holy Place" for childless women wishing to conceive. Having duly amassed their fortune by these means they took up residence in Kronbookhon to enjoy the "good life". There they decided that their joy would be completed only if they had a child. They were "besotted" with the "result", spending vast sums on his pleasures and his "education". Tutors were imported from many different countries, particularly Egypt (renowned for its material prosperity) and Lentrohamsanin thus received a great deal of information, knowledge by means of which he could have obtained some objective reason. But a spoilt "Papa's-and-Mama's darling", he had made no corresponding being efforts in regard to this information and became, therefore, a "very great learned being" or a completely egoistic, automatic, "double-gravity-centered" manifestation. On reaching responsible age, vain and proud, he longed for universal recognition and after much thought decided the only way he could be assured of this was to invent a completely new and original theory to be inscribed on the biggest Kashireitleer the world had ever seen. He first, therefore, set his slaves to produce this Kashireitleer from one hundred buffalo hides joined together and he settled down to dream up his invention. This conscienceless invention was to become the chief cause of the final destruction of all the Very Saintly Labours of the Essence-loving Ashiata Shiemash. 'l'he opening paragraph read: "mans greatest happiness consists in not being dependent on any other personality whatsoever, and in being free from the influence of any other person, whoever he may be!". He further argued that whilst life under the present state organisation was preferable to that of former times, where was the freedom? All had to work for their bread. Of the other worlds where, as taught by the leaders, the souls of men who had lived worthily were to find bliss - let them prove it. Since they could not then men should demand freedom - freedom from the need to work, freedom to be happy, freedom to chose their own leaders. Lentrohamsanin later became one of the three hundred and thirteen "Eternal-Hasnamuss individuals" whose place of existence is the planet "Eternal-Retribution".